This afternoon I finally took decent (by my standards) photos of all the AWI units that have been hanging around waiting to be photographed. This is the most orphaned of my hitherto un-photographed regiments. 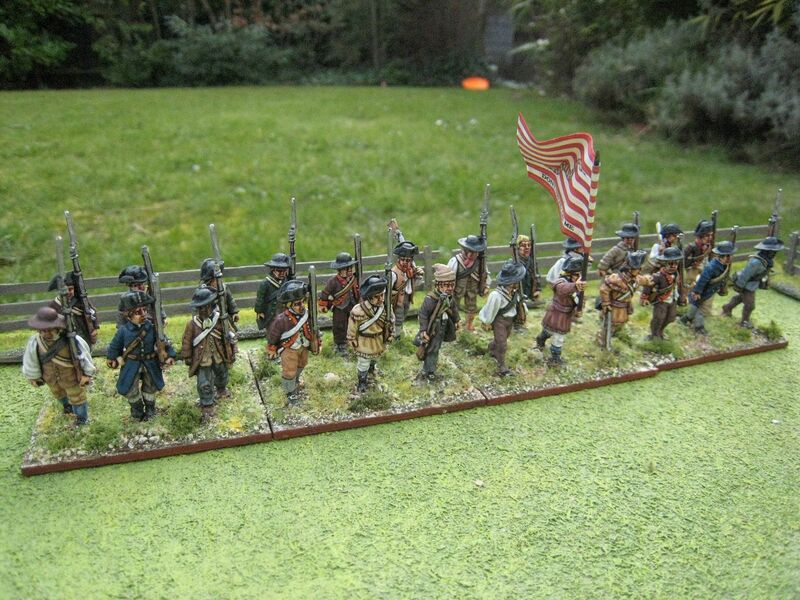 It's the last unit of American militia which I painted at the end of 2013/early 2014. I can remember painting it and I really can't believe almost 2 years have elapsed since. My intention at this time was to use up all my remaining militia-ish figures I had, which I have now by-and-large achieved. Being the last unit to be painted, this is a real mish-mash of Foundry and Perry figures, with a Eureka "ragged Continental" and one Conquest Miniatures F&IW settler. 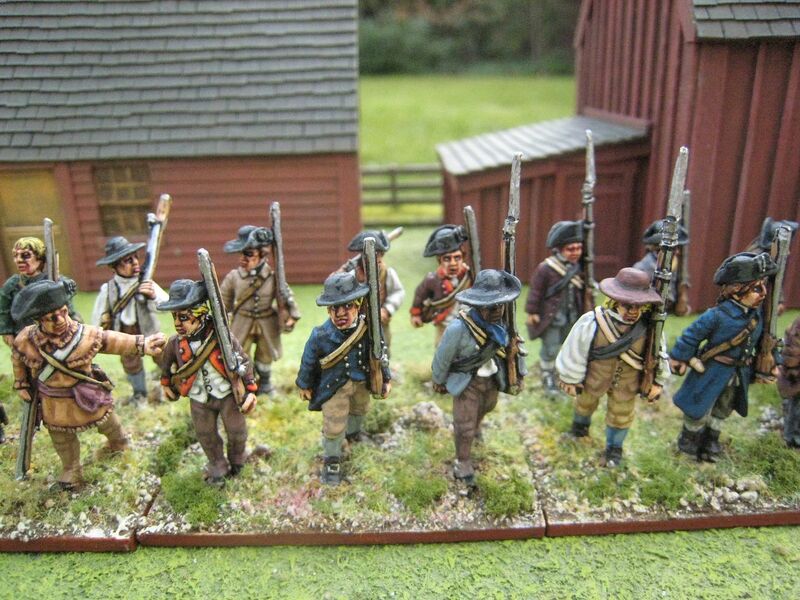 Whilst it's labelled as "militia", it could do as a ragged early war Continental or state regiment. With this unit I'm now pretty much done with militia. What does "pretty much done" mean? 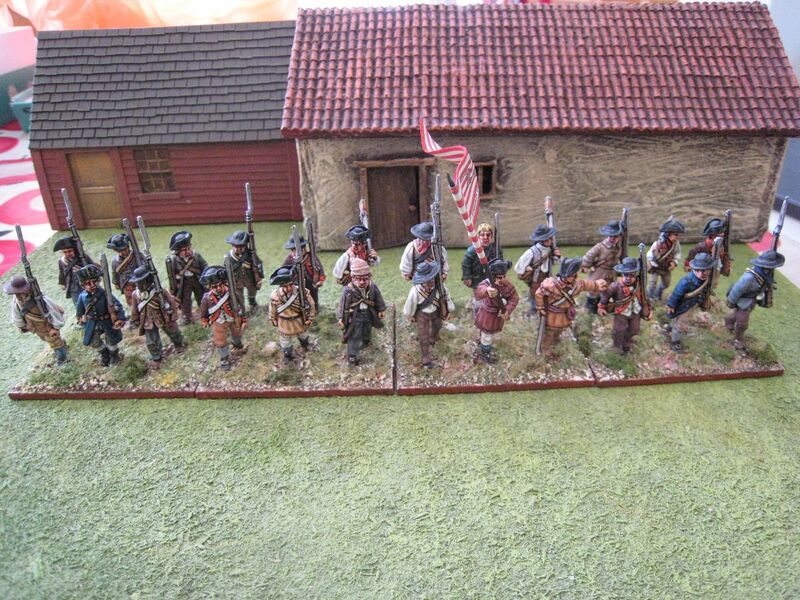 Well, I have a dozen militia units, of between 16 and 24 figures, and that will do for most scenarios. 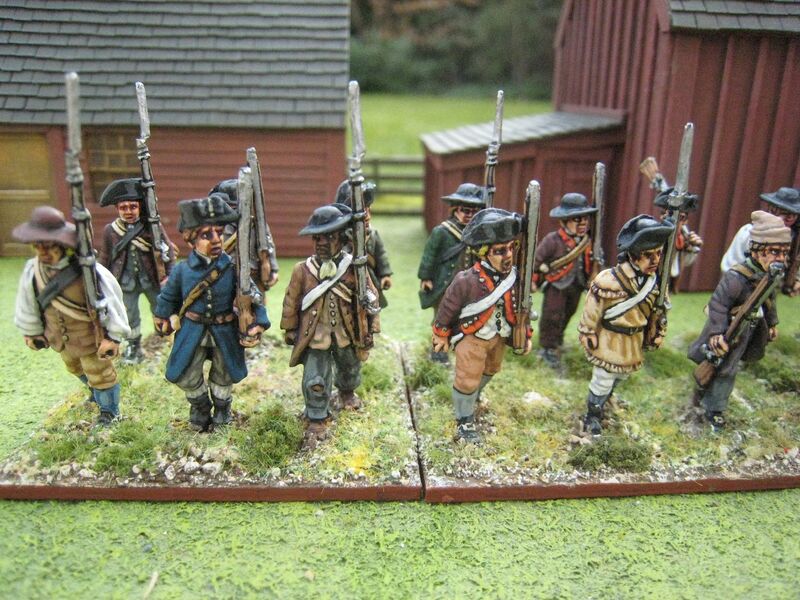 I have written before about how I think the scenarios divide more into "cold" and "warm" weather militia units rather than "northern" and "southern" ones (Guilford Courthouse, for example, was fought on a cold and damp day), but with some allowances I reckon I have enough militia now. These chaps are probably more in the "cold" camp, or at least not "height of summer", dress, although there are some hunting shirt types. In the rear rank is a Conquest Miniatures settler figure - thinner and smaller than the Perry sculpted figures, he makes a very good "teenager". As I said above, the purpose of this unit was to use up various leftover figures, so it's a bit of a "swings both ways" unit. I also expect I will combine stands from it with other units to make larger regiments for those 1:10 games that the more recent "British Grenadier!" scenario books tend to feature. 24 figures. Painted December 2013-February 2014. Flag by GMB. Work, holiday, more work, bad cold, helping out with the "British Grenadier!" 4th scenario book's final stages etc - the usual excuses explain a gap of a month since my last post. But I've been busy and have masses of stuff now going through the basing process: French Napoleonic generals, Continental infantry, more French generals, Boston militia, AWI French chasseurs, my Mameluke band and more AWI cavalry. Eureka's Continental dragoons came out about 5 years ago now, and I've been rather slow at painting up the large number that I have acquired since I first saw them at Eureka's shop in Melbourne. Since then, of course, Perry Miniatures have released a large number of cavalry packs, with the four regiments of Continental dragoons, Lee's Legion and militian types all covered. So is the Eureka range redundant now? Not a bit of it. I think the Eureka cavalry figures remain an essential component of a serious AWI collection, and that's because of the figures' flexibility and the customisation opportunities afforded by their separate hats and helmets. I haven't yet tried using some of the hats on the Perry plastic infantry figures, but I intend to create some "legion infantry" types that way. You don't need much American cavalry for most AWI games, but as it the case with this period there were lots of different units raised during the war and most of them only appear once or twice in the scenario list. A quick peruse the scenarios shows, for example, that the 1st Continental Dragoons appears at Cowpens (4 figures) and Eutaw Springs (2); the 4th appear at Whitemarsh (4); Armand's Legion appear at Camden (6) and Indian Field (8); and at Gloucester you have Dabney's Virginia Legion (10). So you could have half a dozen or so dragoons and just use those figures as generic American cavalry for everything. Or you can try to model some of these particular regiments and that's what I'm intending to do. I painted a unit of South Carolina cavalry 3 years ago but this is another one, inspired by the picture in the Osprey MAA "General Washington's Army (2)" of a cavalryman from "Giles' troop" of the South Carolina militia light horse. The text refers to light blue coats with yellow facings and states that other troops had black, blue, red and green facings. The Osprey makes a distinction between "militia light horse", which includes Giles' troop, and "light dragoons", which includes the units that I painted up earlier, such as Horry's Regiment. I assume this distinction means that the units listed as "militia" were raised for limited periods while the "dragoons" were full-time state troops. Whether the Osprey has the correct units under the right heading is debateable, as there are references to a Captain James Giles who served in South Carolina's 1st Regiment of State Dragoons before joining Hill's (5th) Regiment of Light Dragoons, and then to Captain Thomas Giles who served in Horry's Regiment and then the 3rd Regiment of State Dragoons (the Giles family appear to have been prominent landowners in the north-east of the state). So I think it's possible that the separate units that Osprey list and divide into "militia" and "dragoons" may in some cases be the same, or at least operated together under a common commander, whose name was then given to the "regiment" that he commanded. 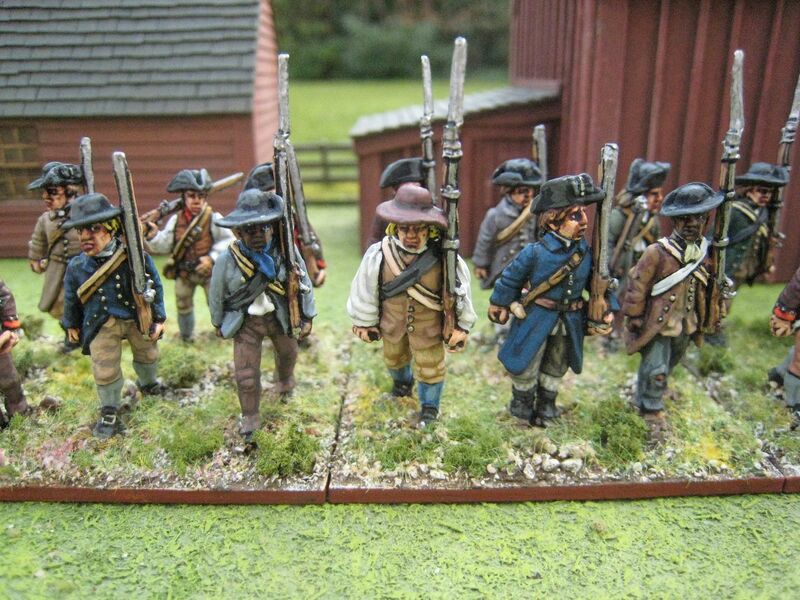 The Osprey also distinguises between the "light blue" coats of the "militia" and the darker blue of the "dragoons" such as Horry's Regiment. But the essay on South Carolina's backcountry cavalry in Jim Piecuch's Cavalry of the American Revolution quotes an earlier historian as saying that the coat of Horry's Regiment had "a light blue appearance". But there were two regiments called "Horry", one raised in 1779 by Colonel Daniel Horry and another raised in 1781 by Colonel Peter Horry. The "light blue" description refers to the latter regiment, which is stated in Piecuch as being "militia" but which is listed as a "dragoon" regiment in the Osprey. So who knows? I may have painted the same unit twice over; or one (or both) of my versions of South Carolina's state dragoons may be completely wrong; or they may both reflect completely different units. But anyway, following the Osprey we have: Giles' troop (yellow facings), Kolb's troop (green) and McDonald's (red). I mixed up the head gear a bit to provide a militia-style/irregular look. 6 figures. Painted August 2015.